From the makers of Dispatch comes Clips, a free iOS 8 clipboard manager that lets you clip anything from bite-sized quotes, to links of interesting stories, to funny animated GIFs right from your iPhone and iPad. 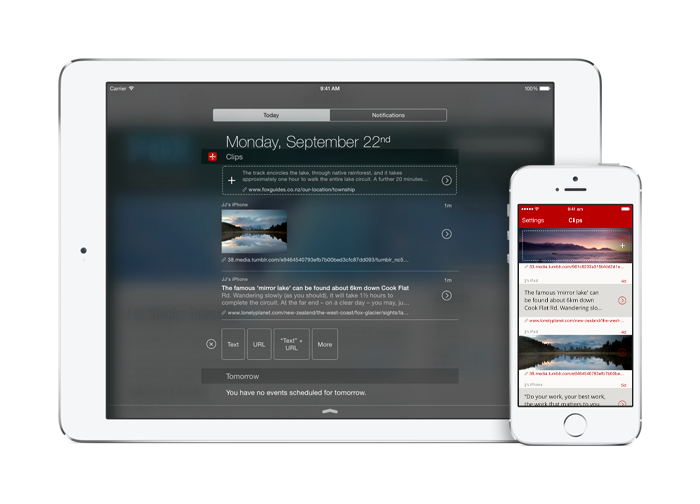 Clip content from any app using our iOS 8 widget. Then, easily access and input your saved clips into any app using our custom keyboard or the widget. You can also sync and access all your saved clips across your iPhone and iPad by upgrading to Clips Pro. hate switching between apps to copy-and-paste multiple pieces of information from the same app or webpage. Clips is free to download and use on your iPhone and iPad. There are no limits for the first week of your use. After which, you can only save 5 clips. If you find Clips useful, you can purchase an upgrade in-app to unlock unlimited clips and syncing between all your iOS devices. Despite the scary iOS warning when you turn on ‘Allow Full Access’, we do not collect any information about the content you store in Clips. iOS doesn't tell you, but ‘Allow Full Access’ is required for our keyboard to access the clips that you've saved in the app. Our custom keyboard does not log any of your input, and requires no use of the internet. Promise. Syncing (unlocked with in-app purchase) takes place through your private iCloud account. We do not store any of your clips anywhere else other than on your own device and in your own iCloud account. We use Hockey App for crash reporting, and Clips automatically sends us crash logs that do not contain any personally identifiable information after a crash. For support, find us on Twitter at @getclipsapp or email us.